To provide Employment Opportunities to the jobless youth TSPSC has introduced TSPSC One Time Registration. 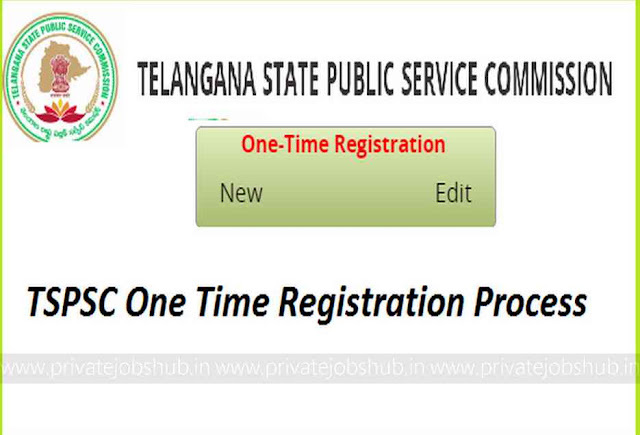 TSPSC One Time Registration System helps the aspirants to receive latest updates released by Telangana Public Service Commission from time to time. Interested candidates for TSPSC Jobs can fill the TSPSC One Time Online Registration by logging on to the Official Portal of Telangana State PSC. Most of you may get confused about How To Fill TSPSC One Time Registration. The, don’t worry we have provided steps to login for TSPSC OTR you can follow them and prepare your TSPSC OTR Login Id and further you can easily check TSPSC Status. Government of Telangana releases numerous jobs in the financial year such as Group 1, 2, 3 & 4, Departmental Exams, and various jobs in Police Department, Revenue Department and many others. Applicants have to keep a regular eye on official to check the TSPSC Notification. But after you submit TSPSC One Time Registration Form you can easily get all the latest notifications. Candidates who are confused TSPSC One Time Online Registration 2018 must have a glance at the complete details given below by the team members of www.privatejobshub.in. Aspirants who’re applying for Government Jobs it will become smoother from them, as with the assist of TSPSC OTR system, applicants can get all updates. One time registration is necessary for the individual who want to get recruitment in Telangana State Public Service Commission. After reaching on home page hit on “One Time Registration” tab that is available in mid section above “What’s New” section. Applicants who are new have to hit on “New” as shown in above image. On next page TSPSC One time registration System form will appear. Firstly, fill Adhar Details properly in suitable box. Then, go for basic details like personal details, address details. Further enter education qualification that is X class details, 10+2 details, diploma, graduation, post graduation and so on. Upload all required documents and certificates with online application form and scanned image of photograph and signature with TSPSC Online Form. After all the asked details in TSPSC online form are filled candidates can tick the declaration which says that “I accept the above declaration”. Your details will be locked and you can obtain your TSPSC Registration ID and Password which will be useful for you while filling any TSPSC Recruitment form. Candidates who want to edit or updates their details in TSPSC One Time Online Registration can follow this underneath section. Steps 2: Move towards below One Time Registration tab as shown in below image. Step 3: Now in One Time Registration image candidates are required to press on “Edit”. Step 4: A new page of TSPSC One Time Registration Edit will appear, which will look like below image. 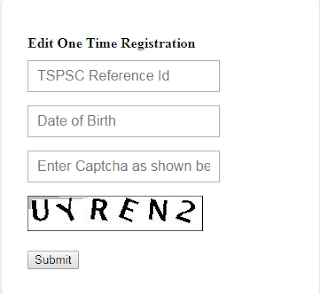 Step 5: Now, candidates need to fill asked details in TSPSC One Time Registration Application Edit like: TSPSC Registration ID, Date Of Birth, Enter Captcha code. Step 6: When all asked details are filled hit submit tab. Step 7: Now, Your TSPSC Registration Form will appear, applicants can make the changes in Edit One Time Registration TSPSC page. Step 8: At last hit on “Submit” tab to update your edit details in TSPSC Registration Login. How I Can Know My TSPSC ID? If aspirants have forgotten their TSPSC Registration ID they can re attain it by going through below mentioned simple steps that are provided for the ease of readers. Now, move cursor towards “Candidate Services” in right side. Under that aspirants need to hit on “Know Your TSPSC ID” link. By selecting said link, a new page will appear which will look like below mentioned image. After filling the asked details in above image like Adhaar number and date of birth candidates have to hit on “Get Details” link. Now, your TSPSC Registration ID will appear you can check it and save it at some secured place so that you cannot forget it again. Why I Need TSPSC One Time Registration Login Id? Applicants who are eager to get Recruitment in TSPSC must have login TSPSC One Time Online Registration. At the time of applying for any TSPSC vacancy first of all candidates need to hit on apply online tab, further new page will come along with a dialog box which will ask for your TSPSC Login ID and Password. At that time candidates will needed to their TSPSC Registration Login Id. After submitting Login ID and Password only then you can fill TSPSC Online Application Form. So, if you are looking for Jobs in Telangana then you should go for One Time Registration TSPSC. Through TSPSC One Time Registration Status you can check all the updates of Telangana State Public Service Commission. To acquire more information about TSPSC One Time Online Registration 2018, candidates may need to visit Official Link and you may also stay connected with us on our web portal by bookmark this page using control + D. For any query or any suggestion related to One Time Registration TSPSC Login Or TSPSC One Time Registration User Login you can just comment us our team will soon reply towards it.